In June/July of 2019 we will send a team of people down to Costa Rica to work construction and serve whatever needs the United Methodist Centre of Alajuela might have for us. The cost of the trip is $1250, but will have multiple fundraisers to offset the cost. A deposit of $200 is required to register you for the trip, and is due October 28. You may click the Costa Rica button to pay your deposit. We are so excited to kick-off the 2018-2019 school year with St. John's Kids Backpack Outreach for McIntosh Middle school students. The mission of the Backpack Kids (BPK) Program is to help alleviate child hunger in our community by providing nutritional support to children over the weekends and during school holidays when they may otherwise go without a meal. Fifth Sunday Offering during all 3 services. Envelopes will be available in bulletins. This will be a great opportunity to help support this wonderful organization that makes a difference in children’s lives. Since our founding in 1908 as the Florida Methodist Orphanage, the Florida United Methodist Children’s Home has enjoyed a strong and vibrant connection with the local United Methodist Churches of the Florida Annual Conference. We continue to seek ways for local churches to be involved in meaningful ways with the total ministry of the Children’s Home. We also continue to rely on the local churches to underwrite the financial needs of this life changing ministry. The Children’s Home is an extension of your local church. We are here to help you and assist you with those difficult family situations that many arise in your church or ministry. Do not ever hesitate to call on us with questions or concerns about children and families in your church. Many calls we receive are not just about admitting a child into care, but deal with available resources, possible alternatives, suggestions and advice on dealing with issues facing children and families in your community. Keeping families together is always a priority. Moving a child out of their home should always be a final measure once all other possible interventions have been considered. For more information, check out their website: www.fumch.org. 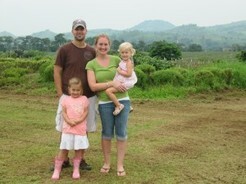 Joel & Missy Davis are serving in the Philippines. Joel’s father, Denny and brother, Josh, both served in the Youth Ministry here! To connect with Joel & Missy, check out their website at www.ntm.org/wp/joel_davis/ or email them at joel_davis@ntm.org. For financial support, give directly to: NEW TRIBES MISSION, 1000 East First Street, Sanford, FL 32771. Make the checks out to New Tribes Mission with a note “for the ministry of Joel and Missy Davis”. You may also follow them by checking out their photo journals through their blog. Kevin & Laura Wooster are working in Siberia as Community Development Workers. They were married at St. John’s and led our Youth Ministry for a time in the 1980’s. To connect with Kevin & Laura, please email them at klwooter1@gmail.com. You may financially support them by making checks payable and sending to: Global Serve International, 2102 SW 47th Street, Cape Coral, FL 33914. Visit their blog at Klwooster.blogspot.com for additional information about their work. This special event is our opportunity as a church family to join forces in helping numerous organizations around Sarasota. Please join us to help make a difference around our community. To view photos from our last event, visit our photo gallery. To find out what other organizations the Women and Men's groups support, please check out their pages.